Autodesk’s decision to make their Design Review 2007 program a free download opens up the collaborative abilities of DWF’s to many across the board. As mentioned in my previous post, it is now plausible to ask clients to install Design Review, and use low-cost DWF’s instead of pricey overnight UPS packages. While creating markups in Design Review is rather straight forward, understanding the full-circle of a markup set gets a little more involved. This multi-part blog will take an in depth look at how to make the most of this technology. The Autodesk DWF format and the Adobe PDF format share a number of similarities. Both formats offer users the ability to create a file which preserves its appearance, and that is easily viewed by other users through the use of a free viewer. Both Adobe Acrobat Reader and Autodesk DWF Viewer have been free downloads for years. Both formats have their own strengths and weaknesses, but when talking about Autodesk products DWF is by far the easiest to work with providing the user the greatest amount of flexibility. More specifically, only DWF’s can be loaded as markup sets or attached through the reference manager in AutoCAD. Point being, while Adobe may offer similar functionality with their PDF format; a PDF cannot go full circle as a DWF can. 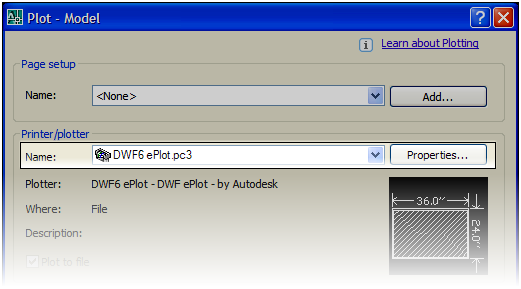 DWF’s can be created from virtually any program with a print command. Although DWF’s can be created from so many programs, were going to focus on creating DWF’s from AutoCAD and using Design Review to create a “Markup Set”. In its most literal definition, a DWF is truly nothing more than a digital print. Since a DWF is nothing more than an electronic print, they can be created using the standard PLOT command. Instead of selecting your normal plotter, select one of the DWF plotters such as the “DWF6 ePlot.pc3”. Other settings such as the page size, pen table, etc should all remain unchanged from your normal plot settings. Upon pressing the [Ok] button, AutoCAD will prompt you for a name and location of your new DWF file. A key disadvantage of plotting your DWF’s individually is that each drawing sheet will be a separate DWF file. While this format works, it’s likely not the most efficient. 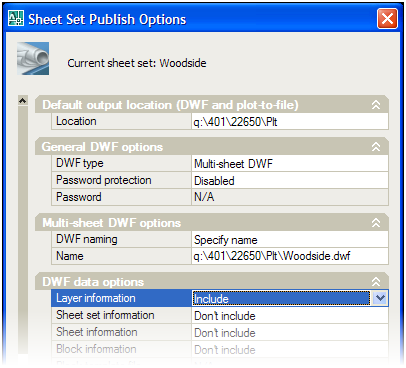 Perhaps the easiest way to create a multi-page DWF is by using Sheet Set Manager. Using Sheet Set Manager it’s possible to publish every drawing in your set by clicking a single button. 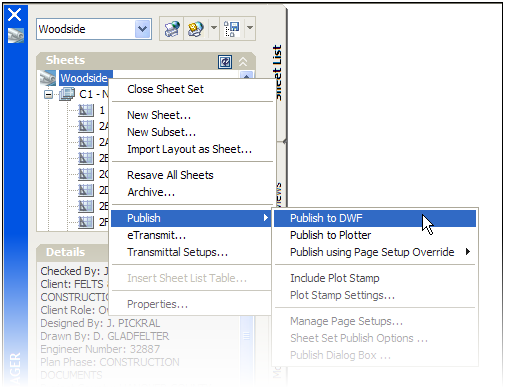 A single multi-page DWF can be created by simply clicking the sheet set, any subset, or a group of individually selected sheets, and selecting “Publish to DWF” from the “Publish” menu. Creating a DWF will take the same amount of time to process as traditional plotting. However since you do not have to wait for plots to come off the plotter itself, refill paper, and all of the other time consuming parts of plotting; creating DWF files will likely reduce your plotting times. While preserving the same quality as its PDF equivalent, DWF’s are often yield dramatically smaller file sizes. Think of it as having your cake and eating it too. I have not outlined every possible way to create a DWF from within AutoCAD, but I have outlined what I feel are the easiest and most efficient ways to create DWF’s. If you haven’t checked out Sheet Set Manager, it is truly a lot more than a glorified plot command. Packed within its interface are a number of tools that aid in keeping title blocks up to date, and managing files more efficiently. Other advantages of Sheet Set Manager will become apparent as we begin to discuss working with Markup Sets. Another advantage DWF has over PDF is its ability to preserve layers. Enabling layers in your DWF will make it so the person viewing it in either DWF Viewer or Design Review will have the ability to turn layers on or off. This can be helpful when needing to review complex designs. To include layer information, simply switch the “Layer information” option to “Include”. At this point we have created a DWF that we can now import into Design Review. Part 2 of the series will look into creating markups inside of Design Review 2007 â€“ so stay tuned.